A K stamped on the inside of a piece of gold jewelry indicates the content of the gold by which the article was constructed. Most gold watches, rings and other gold jewelry have the number 10K or 14K stamped on the inside. In the past and some dentists still do now use 24K gold to fill teeth as it is very malleable. 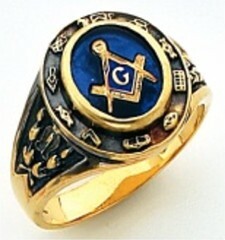 Most Masonic rings and other fraternal jewelry is made up of 10K or 14K gold. As of this date Fort Knox is currently holding about 4,582 metric tons of pure gold worth several hundred billion dollars. This entry was posted on Saturday, April 8th, 2017 at 1:50 pm	and is filed under Freemasonry. You can follow any responses to this entry through the RSS 2.0 feed. Both comments and pings are currently closed.